San Francisco, Feb. 1 – Mayor’s Office of Housing Director Olson Lee terminated the City’s lease with Midtown Park Apartments on Christmas Eve, leaving 139 low-income households in the Fillmore to fight for survival. 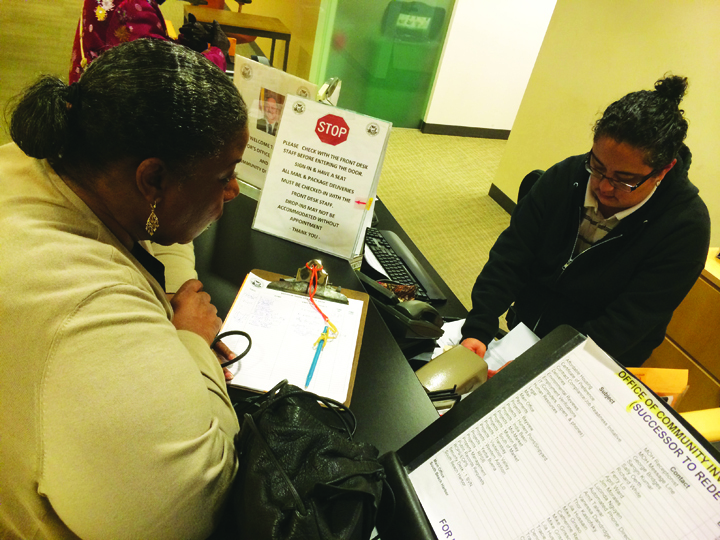 Yesterday, nearly 100 residents of Midtown, representing virtually every household at a vibrant and diverse low and moderate income community in the Fillmore District, submitted a petition to Mayor’s Office of Housing Director Olson Lee asking him to withdraw his termination of Midtown’s 45-year-old lease with the City and County of San Francisco. Later that same day, Director Lee, a former Redevelopment Agency official, gave Midtown residents his answer: No. Director Lee’s answer has left Midtown in a state of legal limbo, as the lease and rental agreements affecting 139 households became null and void this morning. Midtown residents, who are predominantly Black but also Latino, Asian and white, received notice on Christmas Eve that their landlord, the Mayor’s Office of Housing, was terminating their lease in order to raise rents to pay for repairs that the City has neglected for many years. Last week, over 60 Midtown residents, resident leaders and supporters came to City Hall to request help from the San Francisco Board of Supervisors to secure rescission of their lease agreement before the effective date of Jan. 31. Rather than waiting for the City to exercise its right to evict Midtown occupants by force or for the City to coerce residents into signing oppressive new lease agreements with rent increases that displace residents and further drive Blacks and other people of color from the Western Addition, residents of Midtown are fighting back. On Monday, Midtown residents and their legal advisors are expected to file the biggest rent control petition in the history of the City and County of San Francisco in order to protect Midtown from unlawful rent increases or evictions in the wake of their lease termination. It is believed that termination of Midtown’s lease, under which the Board of Supervisors previously established rents, now triggers rent control protection. The City and County of San Francisco, like many neglectful landlords, failed to make basic maintenance upgrades to Midtown for decades and now proposes to level at least two and up to all six Midtown buildings, build new residences and impose dramatic rent increases through new restrictive lease agreements in order to repay the City’s investors. This controversial approach, which Midtown residents have highlighted will lead to displacement and gentrification of residents, has been likened to that of the recently dissolved Redevelopment Agency, which wreaked havoc across the Western Addition during urban renewal in the 1960s and 1970s. Housing Director Lee has said that his actions are necessary to force residents into new lease agreements in order to increase rents and force out those that cannot pay so as to fund the maintenance upgrades that the City has negligently failed to make as the landlord and owner of Midtown. It is well established that landlords and property owners are responsible to make basic maintenance and repair investments on behalf of their tenants. District Supervisor London Breed has pledged her support for Midtown and thanked Midtown’s volunteer resident board of directors for their efforts and leadership at the Board of Supervisors last week. At one point, City officials had blamed the Midtown Board of Directors for the City’s refusal to pay for repairs and for the decision not to pursue a potential cooperative ownership model for Midtown. The Mayor’s Office of Housing later backpedaled, with staffer Joan McNamara indicating during a community meeting that it was their decision not to pursue a co-op. District Supervisor London Breed has pledged her support for Midtown and thanked Midtown’s volunteer resident board of directors for their efforts and leadership at the Board of Supervisors last week. Midtown residents expect a decision on their rent control petition in the next several weeks and will remain vigilant in the interim. The saga of Midtown Park Apartments comes at an ironic period of time in which City officials continue to pay lip service to the notion of stopping African American out-migration in San Francisco during the escalating affordability crisis. To reach Save Midtown Park Apartments, email savemidtownparkapartments@gmail.com. Acusado de ser el colaborador necesario en la planificación del crimen.